2. 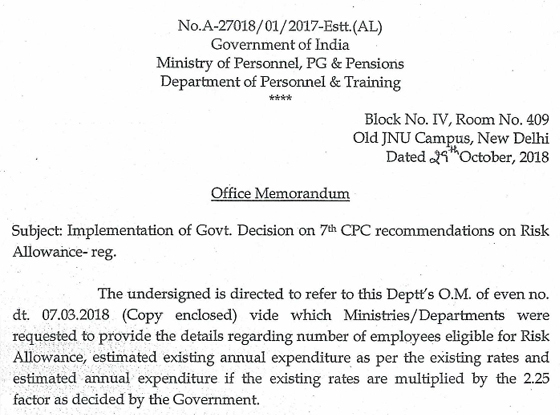 Despite remainders, this Department has received comments only from 12 Ministries/Departments which are – M/o Panchayati Raj, D/o Public Enterprises, Cabinet Secretariat, D/o Atomic Energy, D/o Agriculture and Cooperation, Inter-State Council Secretariat, MHA, D/o Justice, D/o Food and Public Administration, M/o External Affairs, M/o Earth Science, D/o Defence, D/o Defence Production. 3. It is requested that the aforesaid data may be furnished to this Department in the format prescribed in O.M. dt. 07.03.2018(copy enclosed) at the earliest. Dopt Orders on Risk Allowance – Risk Allowance to Central Government employees – clarification reg. Recommendation of Department Related Parliamentary Standing Committee on Compassionate Appointment-Regarding.